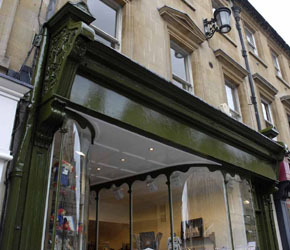 In December 2008 we reported that the listed building shop front has been repainted. The picture we took at the time is on the left. We could find no planning application requesting permission to do this. Some further approved painting has taken place on site. This is being monitored by a member of the Heritage and Environment Team who is in discussions with the owners. 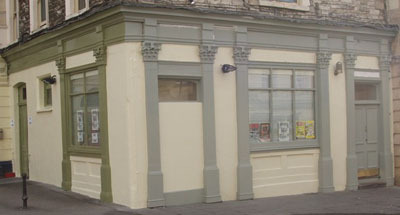 However, in November 2009 the shopfront was seen sporting a new coat of paint. Looking at the window frame in the picture on the left, there is some historical precedent for a dark colour, but the sheen on the fascia in the picture on the right is not correct. A listed building in Milsom street should not be painted in high gloss. A matt finish is appropriate. [8/11/09] We have been informed that the latest colour is within the palette appropriate for this building, and if a planning application were raised, the Conservation Officer would not oppose it. We have taken a closer look at the finish and it seems more silk than gloss, so we probably would not oppose a retrospective application either. So we accept the Enforcement Officer's view that rather than spending effort on pursuing retrospective paperwork, the sensible thing to do is to just close the Enforcement case. We reported Delfter Krug to Enforcement because workmen were repainting their shopfront and we couldn't find a planning application to cover this work on a listed building. We have received a response from Enforcement, informing us that they have checked with the Conservation team and they have stated they have no objection to the new colour, and so the case has been closed. This leaves us with a problem. The Historic Environment Team have long had a policy (based on PPG15) that repainting a listed building with the same or similar colour was "permitted development" but a significant change of colour requires planning permission. This is a significant change of colour, from rich blue to pale grey undercoat (pictured above) and then to a heritage green (pictured right). 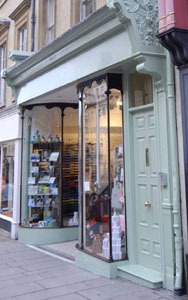 The fact that if there had been a planning application, Watchdog would have supported it enthusiastically doesn't alter the fact that if this establishment can repaint in a different colour without listed building consent, it sets a precedent for other shops who might choose something far less acceptable as the final colour. 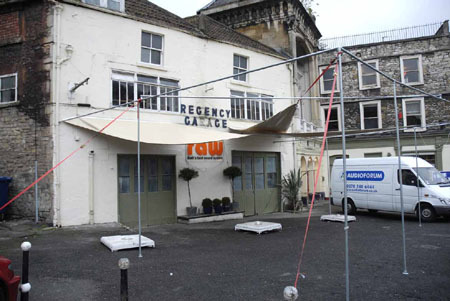 [16/11/08] Early in November, some canvas awnings on a metal frame were installed beside Delfter Krug, attached to the front of the Regency Garage. Later, (though it does not show in this picture) a power lead was seen running back into a window of Delfter Krug, so it must be their awnings. 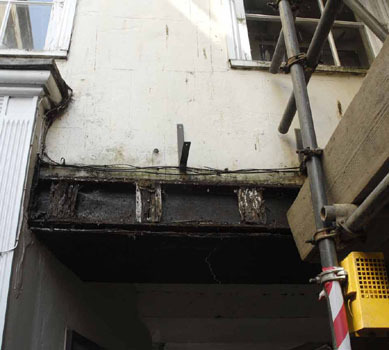 This Regency Garage front is known to be in a weak condition, so there was a real risk that if the awnings collected rainwater and the weight pulled on the front of the building, serious damage might result. So we reported this to both Enforcement and the Historic Environment Team. 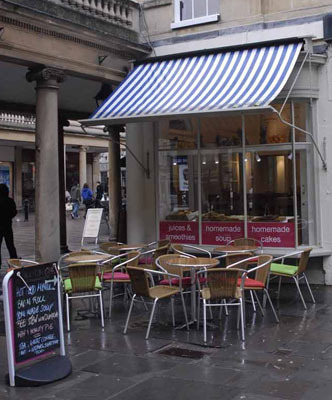 Within days, the unauthorised awnings were gone. The "raw" sign remains. 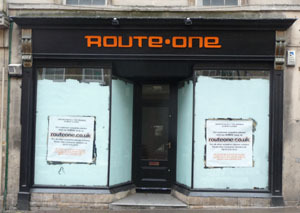 [31/5/09] Enforcement has informed us that Delfter Krug has moved out of the premises so they have nobody to pursue to remove the "raw" sign, or indeed to ask for a retrospective application for the change of paint colour. 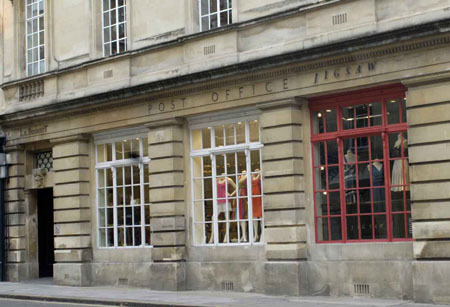 We recognise that Enforcement is unlikely to secure any useful outcome for this (now vacant) premises even though Delfter Krug is now trading from a different address in Bath. We also recognise that any new occupier of these premises will not want the advertisement for "raw" to remain in place. The frame and awning which we were particularly concerned about has already been removed. We will therefore agree to close this enforcement case. 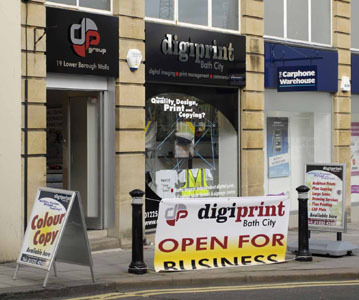 Digiprint are placing out unauthorised signage in the form of an "A" board, a banner stretched between two bollards, and a board on a concrete base. Since our picture was taken on 12 September, the banner has been taken down and replaced by an "A" board. The pavement is narrow at that point, so the "A" board is a nuisance to anybody with a pushchair, and the set is a hazard to anybody crossing the road at that point. We can find no planning application for the newly installed signs. [28/9/08] The Enforcement Officer has spoken to the manager of Digiprint and informed him of his obligation to apply for advertising consent should he wish to have his banner displayed, and received an assurance that it wont be put back. The manager has also been reminded of the correct position that the A boards should be placed in. This verbal action has been followed up by a letter and the shop will be monitored for any further breaches. Unless there are any further breaches, the case is considered closed. Watchdog's spot check on 8th October showed that the boards were in the positions agreed with the Enforcement officer and the banner was no longer on display. This (now closed) shop is difficult to address properly - the building pictured joins the lower floors of No.8 Alfred Street and there are signs in the windows asking that deliveries should be made to Alfred Street. When the shop was trading, its entrance door for shoppers was in Bartlett Street, and the (also closed) business that operated from the upper floor had a St Andrews Terrace address. Long term residents of Bath will remember this complex as "Evans and Owens". 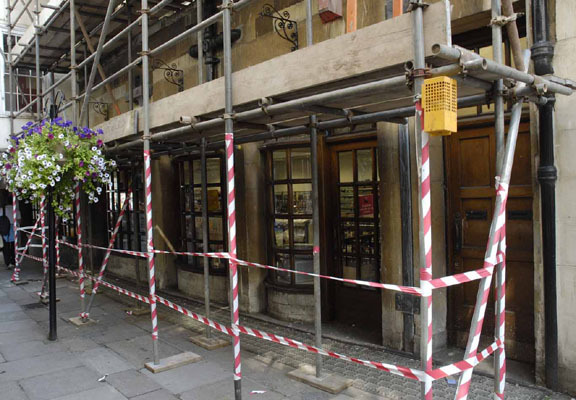 While the scaffolding was in place, workmen in overalls were seen entering the building, though they took great care to prevent the public from seeing into the building. Machinery was heard operating inside, and masonry dust was occasionally seen emerging from the building. We notified Enforcement, who promptly closed the case claiming that no work was taking place on the site, and about that time the scaffolding was taken down. 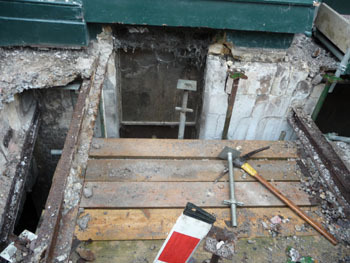 At the beginning of the 25th May week, workmen suddenly arrived and demolished the paving in front of No.8 Alfred Street, which is a a Grade II listed building. Not only is this unauthorised work, but it has left the front of the building in what looks to us laymen to be an unsafe condition. We have informed Enforcement. 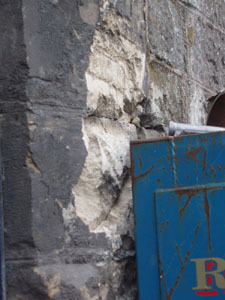 [7/6/09] We have now been informed that the Historic Environment team have discussed and agreed with the owners that this is essential maintenance work and that it should proceed, and they have asked for a Listed Building application to be raised to cover it. The work has started ahead of that application, so technically it remains an enforcement issue and it will remain open on this page until Listed Building consent is given, but we are satisfied that the council officers are monitoring the work to ensure that the pre-application agreement is being followed and we will not be pursuing enforcement action. [9/9/09] The Development Control Committee granted Listed Building Consent for 09/01442/LBA which regularised the situation. This enforcement issue was then closed. 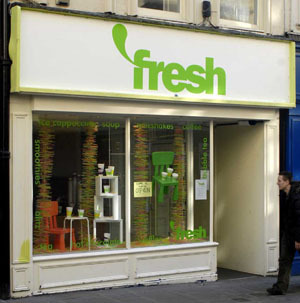 [23/2/11] Having apparently changed occupier, Fresh Shakes And Smoothies Ltd put up new signage on a fascia that is uncharacteristically large, without applying for listed building consent. I email with regards to the complaint in respect of the above. I have attended the premises with a Conservation Officer who has noted that works internally are minimal and that the fabric of the building has not been altered. I note the fascia has been changed and that the old unauthorised "posh or not" vinyl lettering has been removed and new signage which has been sign written onto the fascia applied. Whilst the new signage requires listed building consent I do not consider the breach expedient to pursue as the breach is de-minimus. Our point was about the changes to and size of the fascia rather than the interior works. However it was noted that a Conservation Officer attended, and the officer was clearly not concerned about the fascia, so we have marked the case closed. The fact that there should have been Listed Building consent has been noted to ensure that this frontage is not quoted as a precedent for other similar changes in the street. The colour of the windows was changed without applying for listed building consent, in a colour that is not from the palette normally enforced for listed buildings in the central area (see picture). This has been corrected by enforcement action, and the windows have been repainted in the original colour. By coincidence, the Jigsaw window has been photographed again for the L K Bennett entry below. You can see the repainted white Jigsaw window on the right of that picture. This business has just repainted its shopfront. There is nothing inherently wrong with the colour chosen, except that it is very different from the colour it replaced ("Brinjal") that was given planning permission as recently as August 2009. There is no excuse, because of the recent planning correspondence, for not knowing that a significant change of colour requires planning consent. We believe that consent is essential, even if the colour is acceptable, because it allows the case officer to place conditions on methods and finishes. It is also notable that the correspondence on the earlier planning application (09/01673/LBA) specifically arrives at an agreement that tables and chairs outside were removed from the application and do not form part of the permission that was granted. The presence of tables and chairs in this photograph, and a menu board, are a second enforcement issue. We expect Enforcement to ask for a Listed Building application for the change of colour. We will not be surprised to see the same application requesting permission for tables and chairs outside. We would support the change of colour provided it has a suitable paint finish, but we will object to the tables and chairs, as we did last time. 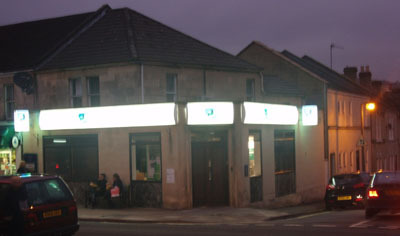 By the end of January 2011, this business had ceased trading and the premises was occupied by another business "Jacobs" who have retained the unauthorised tables and chairs as well as the unauthorised colour. 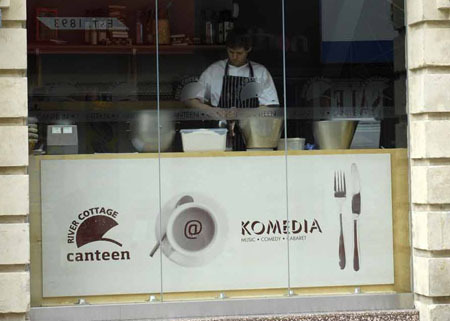 Komedia installed tables and chairs in the foyer, signs in the windows and a modesty screen all without planning permission. Despite all the changes that have taken place (with planning permission) since the building was a cinema, it is still a Grade II listed building and its street frontage is important. Plywood is not a suitable material. A few days after the picture on the right was taken, that on the left appeared to replace its plainer predecessor. Again, no planning application was made. 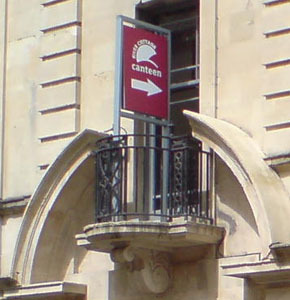 Then a sign was installed on the first floor balcony (picture left). This was reported to Enforcement and was allocated a new enforcement number 09/00511/LBWORK. This balcony is a key feature of the frontage of this listed building and it shouldn't be defaced in this way. And now a bakery has now been installed in the window (picture right). We believe this raises further listed building issues. We have not had the opportunity to make a proper examination of the bakery installation (and others are better qualified than us) but we couldn't see all the facilities that Health and Safety normally insist are provided for staff working in food preparation areas. We originally reported a sign which was installed on the first floor balcony (picture right). This was reported to Enforcement and was allocated a new enforcement number 09/00511/LBWORK. On 20th August we were informed by Enforcement that the sign on the balcony has been removed and the case closed. [18/10/09] This week we noticed that the sign on the balcony has been replaced and we reported that the case should therefore considered reopened. We were informed that we should raise a new Enforcement request. [1/11/09] The latest picture, on the left, is clear evidence that it is the same sign in the same position. We are complying with the request to raise a new Enforcement report. However, we are concerned at this turn of events. If it is always considered that the closed case is permanently closed, there is nothing to stop Komedia putting up their unauthorised advertisement, discussing it with the Enforcement officer for a while. then agreeing to take it down. Then they can put it back again a month later and the process starts all over again. From Komedia's point of view, they get an unauthorised advertisement most of the time with no penalty. From the council's point of view, they get all the enforcement work to do with virtually no benefit. We maintain that this is the same offence, and should be the same Enforcement case. Then the offence is cumulatively repetitive, and every occasion when the advertisement is on display is added to all the previous occasions as one set of evidence, so that if the council wishes to exercise the enforcement powers available, a pattern of persistent offences can be shown. [8/11/09] The sign has once again been taken down, and the Enforcement case is closed. We have been advised by the Enforcement Officer that Komedia will now raise a planning application for the permanent installation of the sign, and it will be going through the planning system in the normal way. 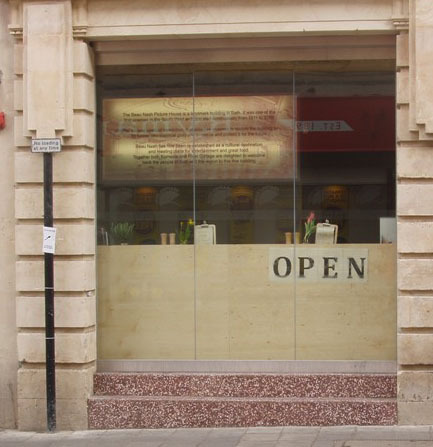 Planning application 08/03205/LBA was for internal alterations to their Milsom Street Branch. That application is currently in its public consultation period, which expires on 17th November, after which a planning decision can be made. Having looked at the plans, Watchdog sees no reason to submit an objection to what is proposed, and is content to wait until the case officer makes a decision. Whilst the applicants might have a reasonable expectation that they will be given planning consent, because they provided a lot more drawings at the request of the case officer, it is a legal requirement that they must wait until they are given that consent before they start work. Nevertheless, on 1st November, workmen could be seen inside, carrying out the alterations. Lloyds have jumped the gun, hence the reason why we have reported this to Enforcement. [16/11/08] Despite planning permission still not being given, one of our members went into the branch and told us of the work that has been carried out: "The ceilings are an absolute mess. There is evidence of some lath & plaster in places but you can see that it has been ripped out. I could not see any cornice work but there is still a fair amount of gubbins hanging from the ceiling. It is absolutely wrecked. There were a group of men in suits and badges waiting around and looking at the ceiling, so what they were there for I don't know. It is an absolute disgrace." [21/12/08] The Case Officer discussed the alterations in hand with the applicants, and secured agreement to remove the lowered ceiling and the plans to block out an existing window, and revised drawings were submitted on that basis. Planning consent to application 08/03205/LBA was then given to those revised drawings on 1st December 2008 and we have no problem with that. We now consider this enforcement matter closed. [21/12/08] We have checked the illumination levels and they have been reduced to a level that is comfortable on the eyes in the dark. We thank Lloyds TSB for their prompt action and consider the problem closed. I.L.E. Technical Report Number 5 (Third Edition). "Lit zone". [14/12/08] We have had a report that the illumination levels have now been reduced. We will check. [7/12/08] Enforcement have confirmed that there is no planning application, because Lloyds submitted one and it was returned to them to say that consent was not needed for the changes proposed. What has been done to the outside of the bank does comply with the plans that were submitted (for which consent was not required). However, the plans did not specify the illumination levels, and if we think that they are excessive (which we certainly do! ), then we should bring the matter to the attention of the Environmental Protection Team. We accept that as an Enforcement issue this is now closed, but we will be trying to get the illumination reduced to the standards in the box on the right. [23/11/08] We cannot find a planning application to cover it, but we strongly suspect that Lloyds Bank has replaced its earlier fascia with a new one where the levels of illumination appear to exceed the "Lit zone" standard (see box right) by a considerable margin. The photograph left was taken just before dusk. 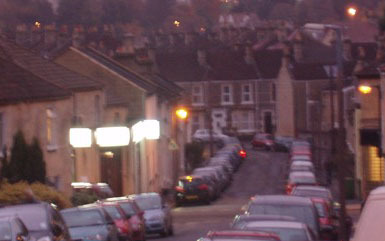 Compare the brightness of the fascia with the standard street light nearby. The pictures below were taken at dusk and after dark. The illumination is so bright that it is difficult to look at after dusk, and it must be a traffic hazard. Again, compare the brightness of the fascia with the street lighting and the rear lights on the moving cars. The window of this establishment has suddenly developed some flashing signs (although on some days the signs are steady and do not flash). The animation shown here is not an exact copy of how the flashing signs behave, but it does give a clear indication of how prominent the signs are (with apologies for the slight camera movement between frames). 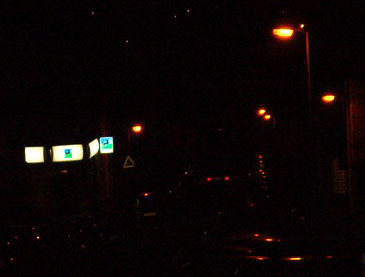 Generally, illuminated signs require planning permission: as a minimum advertising consent, but there has been no such application made. 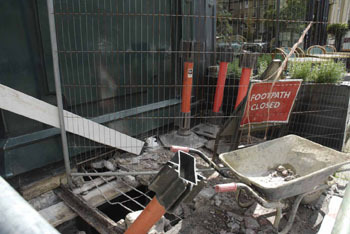 In November 2010, it was noticed that the offending sign had been removed, so we assume that the Enforcement case is closed. Rosewell House is Grade I listed (described by Pevsner as 'Baths most ornate and unashamedly Baroque with German-Flemish influence') and is occupied by more than one business, with residences above. Until recently, one end of the building housed a newsagent's with a barber's shop behind. The newsagent's closed a few weeks ogo, but the barber's continued for a while after that until it too closed. Then a group of builders entered and started removing internal doors, without planning permission and without listed building consent (which for a Grade I listed building has to have the Secretary of State's agreement). [19/10/08] We have received a response from the Enforcement Officer explaining that the owners have agreed a programme of works with the Council's Historic Environment Team to rectify the damage. The approach being taken should lead to a satisfactory conclusion, but we will keep an eye on this building to make sure that the work agreed is carried out. As far as enforcement is concerned, this is considered closed. We spotted this shop with a painter at work on the shopfront. As this is a listed building in a conservation Area, planning permission is needed for a significant change of colour, according to both PPG15 and the Heritage Environment Team. This building used to be the Postal Museum. In August 2007, planning permission was granted for a change of use, with a retail premises on Ground Floor and Basement, and residential above. However, we could not trace any Listed Building application to redecorate the shopfront. The fascia has also been illuminated by two spotlights and these were seen working Friday evening. 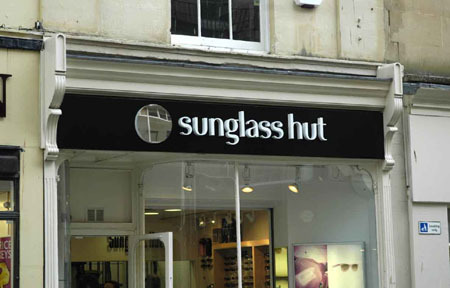 Not only is planning permission necessary for installing illumination, the style of lighting is contrary to the council's Shopfront Guide, so permission is unlikely to be granted. [31/5/09] Having painted the shop front in the wrong colour and the wrong paint finish for the age of the building, then installing a fascia sign in the wrong materials and installing swan-necked lights to illuminate it, Route One has now abandoned the shop (see picture on the right; the signs in the window indicate that they are now only trading by mail order). 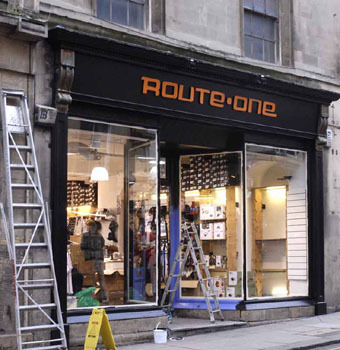 With nobody to pursue, we expect Enforcement to close the case, and we would accept such action provided they put on record that the fascia lights must be removed by any new tenant in that shop. 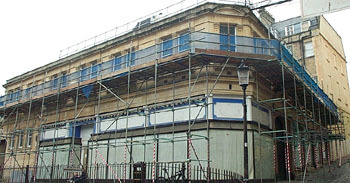 [21/6/09] We have closed this Enforcement issue because the work to convert the premises granted permission in 2007 has started, and one of the unauthorised fascia lights has been damaged, so they will almost certainly be taken down. Rymans applied for planning permission (08/01572/AR) for some brightly coloured and illuminated signs, and while they were waiting for a planning decision, went ahead and installed them (our photo was taken a week before the planning decision). Then the planning application was refused on the grounds that they were inappropriate for the location. Nevertheless, the now unauthorised signs remain. [1/11/09] This enforcement case is closed by the grant of planning permission for application 09/02742/AR on 21/10/09. The drawings given consent change the background colour from red to cream and require the removal of the fascia illumination. We are happy with these agreed changes, and will remove this premises from this Enforcements page when the work is carried out. 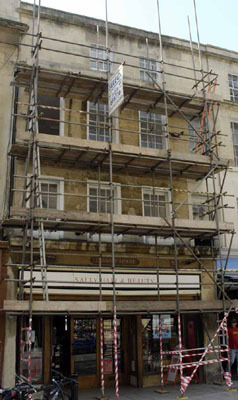 Scaffolding has been erected to the High Street elevation and also the rear elevation (Northumberland Passage). It appears something has been deliberately removed or accidental damage has occurred to the Northumberland Passage elevation as a metal beam has now been exposed (picture right). A window has also been removed on the front elevation (picture above left). There is a planning application (09/02443/LBA) for external works to the building. As far as we are aware, this application has not yet been determined. We have objected to this application, not because we do not support the repair and restoration of this building (because we do), but because the methods and materials to be used are not adequately specified and this is too important a building (originally named Danvers House) to suffer from inappropriate repairs. So we are hoping that Enforcement can stop the premature work currently taking place so that the Conservation Officer can ensure through discussion leading to conditions attached to a Listed Building Consent that appropriate methods and materials are used and an agreed standard of workmanship is adopted. (That doesn't mean that we think what is currently being done isn't acceptable, just that we don't know, and it pays to be sure). [19/9/09] On 10 September 2009, Listed building consent was granted. This specified materials and methods that we are happy with. However, all our other concerns were dismissed as "maintenance work", so we will keep watch to make sure it is like for like. A listed building application (08/01047/LBA) covered internal alterations and new signage on the front. Another application (08/01049/AR) applied for advertising consent for the signage. Both were refused: whilst there was no significant objection to the interior alterations, the style of the signage caused both to be refused, on 9th and 13th June respectively. 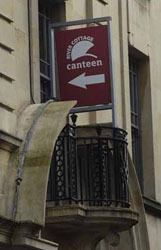 Nevertheless the unauthorised signage was installed (our photograph was taken on 16 June 2008. This has been enforced and we have been informed that the offending signage removed and replaced. No comment has been made about whether the internal alterations have gone ahead despite the listed building application being refused. We will check this, but the case officer considers the matter closed unless we find anything new. 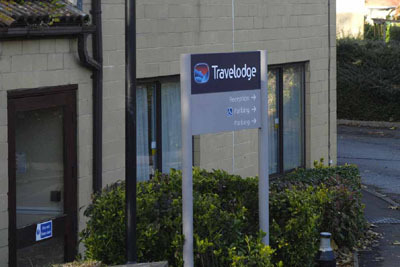 Planning Application 08/03963/AR is for four illuminated signs and four non-illuminated signs for the Travelodge Hotel (formerly Thimble Mill) at the end of the Kennet and Avon canal. Despite the consultation period for the planning application being not yet expired, the signs have already been installed (one of which is pictured here). We have reported this as an Enforcement issue, and have also objected to the signs because they do not comply with the standards in the council's Shopfronts Guide. This is probably the same signage that has been installed in the other Travelodges up and down the country. It is therefore not appropriate nor in context for its location in terms of style, colours, materials and quality and it detracts from the conservation area and the World Heritage Site. Some of the signage appears over scaled and dominant and not sensitive to its setting. We hope that these plans are refused permission and a new set of proposals is submitted for a high quality design in traditional materials that is more in keeping with the local context. Planning application 08/03963AR resulted in a split decision on 11 December 2008 where three of the signs were refused permission and the remainder were approved. Theoretically, enforcement action should have followed but application 09/00655/AR was raised soon afterwards for slightly modified signs and despite the objection lodged by Watchdog this application was subsequently granted consent on 30 April 2009. We accept that this decision closes the Enforcement case. 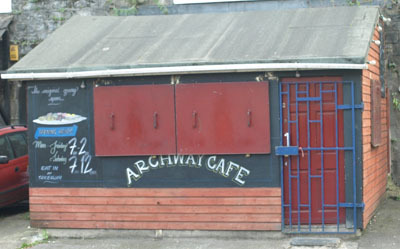 The first of two enforcement cases for Twerton Viaduct involves the Cafe. The picture on the left is how it used to look, and that on the right is how it looks now Timber cladding and grey signs are not ideal so close to Brunel's elegant Twerton Station, but brilliant white and bright red are unacceptable. 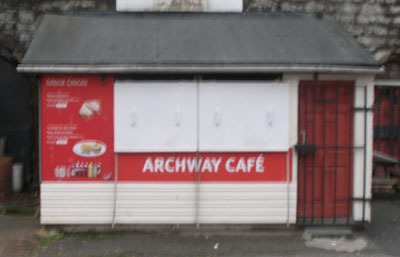 The heritage guidelines say that a significant change of colour requires listed building consent, and no application was made by the cafe, and therefore it becomes an enforcement issue. As part of the research for this item, we examined the past planning applications that are on-line for this run of arches, and we couldn't find any record of permission being granted for this construction to be attached to the viaduct. Perhaps it should not be there at all? Nevertheless, on 2 December 2010 the Enforcement Case was closed: the notification said "I have consulted with [a conservation officer] regarding the matter who is of the opinion neither breaches are considered expedient to enforce. The cases will be closed accordingly." Given that Network Rail have expressed a desire to restore Twerton Station and Twerton Arches when funding permits, this decision is considered short-sighted. We would be delighted if there was a change of heart and this case was pursued, but realise that such an event is unlikely. We had already reported to Network Rail the damage that was being caused to the viaduct as skips are removed and replaced (picture left), because the arch is leased by Network Rail and this level of damage to the structure might infringe the conditions of the lease. Then an unauthorised sign appeared, attached to the Grade II listed viaduct without listed building consent. 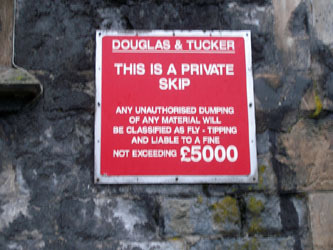 Apart from the sign being irrelevant (prosecutions for fly tipping are pursued by local authorities not the users of skips) it has been affixed by drilling holes in a listed structure and therefore became a matter for Enforcement.